Total charitable giving is predicted to increase by 3.4 percent in 2019 and by 4.1 percent in 2020, according to The Philanthropy Outlook 2019 & 2020 released today. The report is researched and written by the Indiana University Lilly Family School of Philanthropy at IUPUI and presented by Marts & Lundy, a leading strategic management consulting firm. “As long as the economy remains strong, Americans should expect to see overall growth in charitable giving in the next two years, driven in part by steady economic growth, particularly growth in personal income. Many other economic indicators that affect giving, including employment and Gross Domestic Product, are positive as well,” Osili added. 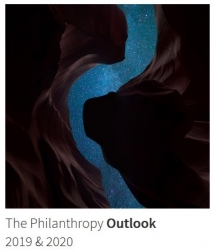 The Philanthropy Outlook uses empirical data produced through rigorous analysis to develop projections for total giving, giving by source and giving to three types of recipient nonprofits (education, health and public-society benefit organizations), and describes how different economic variables and other factors will impact giving in 2019 and 2020. The report examines the complex environment for philanthropy and emerging trends related to giving by high-net-worth individuals/households. Total charitable giving is predicted to grow (3.4 % in 2019 and 4.1% in 2020), rising above the historical 10-year, 25-year, and 40-year annualized average rates of growth. To understand the full scope of the dynamic giving environment expected in 2019 and 2020, the macro-economic climate and ongoing donor responses to the 2017 federal tax law changes must be taken into account. While the ways in which the confluence of these factors will play out for American philanthropy cannot be fully known at this time, The Philanthropy Outlook draws on recent economic forecasts and analyses of the law’s anticipated effects to present projected growth and three potential scenarios that provide context for the baseline projections outlined in the report. Under the Uneven Growth Scenario, estimates for total charitable giving would make much of the regressive effect of the 2017 tax law less apparent. Since high-net-worth individuals/households are already responsible for a large portion of individual/household giving, enough economic growth—even if concentrated almost entirely among the wealthy—would result in growth in individual/household giving. The picture for corporate philanthropy is less clear: strong economic growth may not do enough to offset the decrease in tax incentives for corporate giving, particularly if overall consumer sentiment is weak. Foundation giving would be strong due to the performance of the Standard & Poor’s 500 and GDP. Should the Flat Growth Scenario occur, total giving could stagnate or possibly decline because growth in the market and the economy would flatten by 2020. Individuals/households—still unclear about how to maximize the benefits of giving under the 2017 tax law—may put off making charitable contributions until they are more certain, dampening growth in individual/household philanthropy. Due to S&P 500 and GDP growth realized in previous years, foundation giving would not immediately decline. Corporate giving may increase slightly, although this would largely depend on companies’ reactions to the new corporate tax rates. Donors, fundraising professionals and policy makers need rigorous data and reliable information to help them plan for the future. In addition to the projections and scenarios, The Philanthropy Outlook 2019 & 2020 includes discussion of specific tax policy changes and of economic factors expected to affect giving. The Indiana University Lilly Family School of Philanthropy at IUPUI is dedicated to improving philanthropy to improve the world by training and empowering students and professionals to be innovators and leaders who create positive and lasting change. The school offers a comprehensive approach to philanthropy through its academic, research and international programs and through The Fund Raising School, Lake Institute on Faith & Giving, the Mays Family Institute on Diverse Philanthropy and the Women’s Philanthropy Institute. Follow us on Twitter @IUPhilanthropy or “Like” us on Facebook. Marts & Lundy is the one of the world’s most innovative and successful strategic management consulting firms. With offices in America, Canada, Australia and the United Kingdom, Marts & Lundy offers the world’s best-known philanthropic organizations an unparalleled depth of expertise and breadth of perspective on philanthropy. Since 1926, the firm has served thousands of mission-driven organizations with annual giving and campaign strategies that generate hundreds of thousands to several billion dollars. Founded in the belief that philanthropy has the power to transform not only institutions but, more importantly, the world, Marts & Lundy remains steadfastly committed to contributing innovative thinking and thought leadership to philanthropy. Visit our website. Follow us on Twitter @MrtsAndLndy and on LinkedIn and Facebook.